Five Rainy Day Activities at Home - With Things You Already Have! Fall is flying by and with winter around the corner, it is as good a time as any to be thinking about what you can have ready in the house for when the weather does turn. Here are five fun, creative activities that will keep you and your little one busy on a rainy day. And better yet, we are sharing these activities because, most likely, you have everything you need to do these! 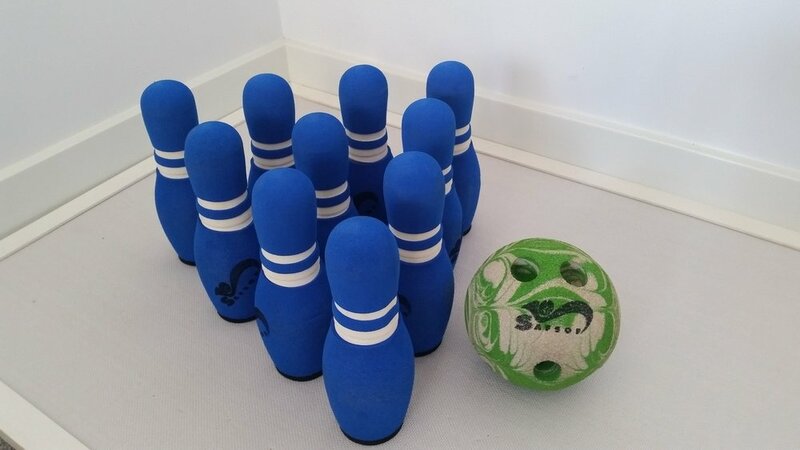 Indoor bowling at home: If you have pins, great! If not, think of what could be substituted for bowling pins. You could stand up paper towel rolls or use empty bottles (plastic ones, of course) or milk cartons. Whatever you use, you can set them up in the hallway and use any ball you have to roll the ball down the hallway and bowl! Cardboard boxes and imagination: Yes, all it takes is a good cardboard box to occupy children and their imaginations. A box (or boxes) can become anything. With big boxes, you can draw and decorate them to be a car or different compartments of a train. Smaller boxes can turn into airplanes or birds or animals. Some of them could turn into houses. Use your imagination. Having a few of all different sizes helps to create different things. Indoor mazes: Using nothing but tape (we like the blue paint tape that easily removes from any surface with no damage), you can create different patterns on the floor for your child to walk through. Think of it as a maze that helps promote coordination as they learn to walk in between the lines or jump from one thing to the next. They can walk forward and backward too. Edible jewelry making: Have some string on hand or, even better, some pipe cleaners. Using what you already have, you can teach your toddler how to put Cheerios (or other round snacks you might have) on the string or pipe cleaner. They can tie it into a bracelet and enjoy. Puddle jumping: We are saving the messiest for last. You probably have a raincoat on hand, some boots (or shoes you don’t mind getting wet), and an imagination. Take your little one out during a break in the rain. You can explore the puddles - which ones are big and small. You can jump in them and see how big the splash is. You can hop from one to the next, or you can bring some bath toys and see how they float in a puddle. These are some ideas for activities using what you might already have in the house. Of course there are more activities you can do - some of them requiring a bit more planning (and shopping), whether it be cookie baking and decorating or making homemade play dough. And, of course, there are the out-of-home activities too! On a rainy day, you can take advantage of drop-in classes at children’s gyms or free activities like story time at the library. We would love to hear from you! What are some of your favorite activities to do with your little one on a rainy day?